Heaven Sent: Sandwiches, songs and a personal touch at The Tin Angel CafÃ©. When I dropped into The Tin Angel Café without a dinner reservation last week, I was surprised that co-owner Robin Fairchild remembered me from a previous visit. It wasn’t that she knew me as a restaurant critic or even knew me at all. She just remembered that a buddy and I had stopped by for lunch on a very busy weekday during the Downtown Dine O’ Round a few weeks ago. She was the only server working that afternoon and said that she attempts to burn every customer’s face into her memory on days like that so she can personally thank them for coming back and, hopefully, remedy any ill will that might have surfaced. So she squeezed my shoulder, thanked me for returning to The Tin Angel and promised a better experience this time. I was a bit bewildered. I had noticed that the restaurant was busy at lunch during that Dine O’ Round day, but my friend and I had had an absolutely delightful dining experience. There was absolutely nothing to apologize for. We’d lingered for some two hours, catching up on conversation and enjoying our food. But that’s just the way these kids roll. Fairchild and her partners Kestrel Liedtke and husband Jerry Liedtke, who runs the small kitchen, aim to please. And they aim to do so sincerely: no canned speeches, no scripts, no B.S. Just honest-to-goodness friendliness and warm hospitality that oozes over their customers. These restaurateurs are bohemians with bonhomie up to their wacky hairdos. In cool and cold weather, it’s a small spot with a few tables in the back dining room and a few more near the front-room kitchen, which also serves as a sort of parlor on weekend nights when there’s live music. In warm weather, The Tin Angel Café doubles in size, thanks to an outdoor deck that overlooks 400 South. The place is outfitted with hangings from local artists—Cat Palmer’s photography was on exhibit during my last visit—and tin angels. Lots of tin angels. It’s a smart-looking joint that’s as comfy as your favorite pair of sneakers, which is what Fairchild wears on duty, by the way—cool ones. I learned, incidentally, that Fairchild got married last week. Not much time for a honeymoon, though; she’s got a restaurant to run. I pity the fool who passes on Tin Angel’s Italian barbecued-beef sandwich ($10). 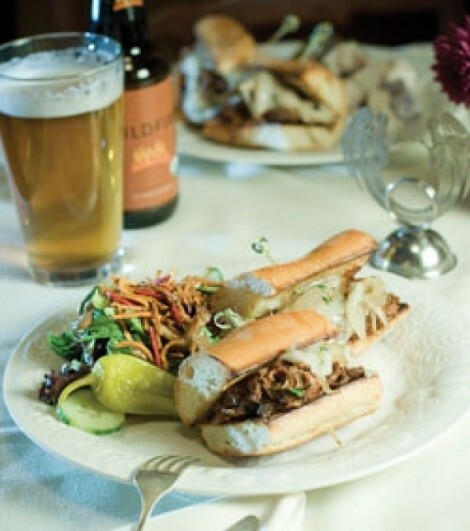 It runs as a special now and then for lunch, and it really is special: a rib-sticking sammy with caramelized onions and provolone on a hearty baguette stuffed with slow-cooked, tender beef. The Peruvian purple potato salad on the side was the perfect accompaniment, along with a natural Blue Sky cola. The Tin Angel also serves wine, organic fair-trade coffee, Italian sodas, freshly brewed black-mint ice tea and lemonade, as well as local beers, PBR in a can and even brunch-style mimosas, screwdrivers, Bloody Marys and Bailey’s with coffee on Saturdays. A hefty appetizer of thinly sliced breasaola carpaccio ($8), nutty tasting arugula, fresh-shaved Parmesan and a lemon/olive-oil/sea-salt dressing is plenty good and plenty for two people. It’s a nice prelude to the dreamy chicken and Cambozola sandwich ($10), served with a zippy lemon-garlic aioli. It’s no fetish, but I have a habit of checking out restaurant restrooms. They matter mightily but are usually an afterthought. Given that The Tin Angel’s water closets are front and center in the main dining room, it’s fortunate that they are so beautifully appointed—as is the entire eatery, although in a laid-back, refreshingly kitsch-free sort of way. Anyway, you’d do just fine listening to Wright and treating yourself to a light dinner of Tin Angel’s organic spinach salad ($8). It’s a generous plate of fresh spinach dressed in pleasingly straightforward balsamic vinegar and olive-oil dressing and topped with julienned strips of Fontina, grape tomatoes, sweet onion slices, crunchy pine nuts and crisp pieces of pancetta. Like the homemade bruschetta at Tin Angel, the organic spinach salad is especially delightful when chased down with a glass of DuBoeuf Chiroubles Beaujolais ($6). Not quite so delightful was my chicken piccata dish ($18). The steamed al dente broccolini that sat on the side was tasty, and the pan-seared organic chicken breast (pounded thin, as it should be) was served in a classic white-wine, butter, lemon, garlic and caper sauce. So far, so good. But my perfectly cooked linguine—which seemed to be freshly made—was sadly inedible thanks to a thorough dousing in harsh truffle oil. Now, I’m not a fan of truffle oil to begin with, but my pasta was bathing in it. I’d estimate 10 to 20 times the amount necessary, leaving an icky taste in my mouth. That’s the bad news. The good news is that chef Jerry wasn’t in the kitchen that night, so perhaps the mistake can be blamed on a part-timer. At any rate, our stellar server/owner Fairchild, having noted my nearly untouched linguine, removed the item from our bill without question. All of which—along with a superb panna cotta dessert ($5)—left a very good taste in my mouth. Got Thanksgiving Day plans? If you happen to be in New York City on Thanksgiving, you can stop by the James Beard House for a Thanksgiving dinner showcasing some of Utah’s top chefs. Three Utah restaurants will be represented at the James Beard House on Thanksgiving day by Greg Neville (Pine & Lugäno), Matt Barrigar (Solitude’s St. Bernard and The Yurt), and Jed Banta and Chad Horton (Metropolitan). • However, even if you don’t plan on spending Thanksgiving holiday in New York City, you can still get in on the fun. On Wednesday, Nov. 7, the Salt Lake Convention & Visitors Bureau will host a special James Beard preview dinner at Pine restaurant. Says SLCVB President and CEO Scott Beck, “We’re really excited about this dinner because I know the James Beard Foundation is considered the most prominent gastronomic organization in the United States.” Quite true. The five-course dinner with dessert and a hors d’oeuvres reception includes dishes like elk carpaccio; seared Hudson Valley foie gras with candied yam, marshmallow and brown-sugar ice; cider-braised rabbit; and roasted guinea-hen breast with pan gravy. The cost is $60, plus $35 for wine pairings from Austin Hope Vineyards. To RSVP, phone 288-2211. • The folks at My Girlfriend’s Kitchen are setting out to make Tuesdays “the healthiest day of the week for households across America.” Tuesdays between 10 a.m. and 7 p.m., the Utah-based company offers a home-style dinner which serves four to six people for $20. According to co-founder and President Marcia Hales, “We created $20 Tuesdays so at least one day a week, instead of pulling into the drive-thru for a big serving of trans-fat, ... anyone can drop into a My Girlfriend’s Kitchen and make a great dinner in under five minutes to take home and cook for just $20.” For more info, visit MGFK.com.